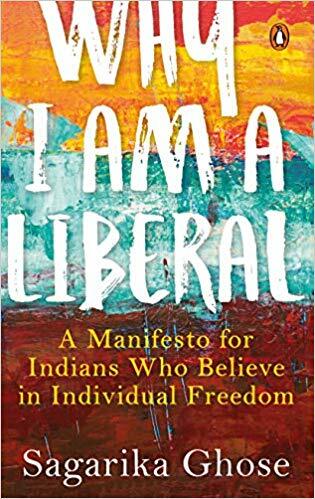 A senior journalist and columnist Sagarika Ghose’s ‘Why I am a Liberal’ is related with individual freedom. She focuses on the contemporary social, political and economic issues in India, especially those which are imposed on individual freedoms by the Big Government(s). The democratic values; liberty, equality and justice have been continually trembling because the Big Governments are imposing the number of new norms in the name of so-called ‘nationalism’ which leads to destabilise and damage the social fabric of India. 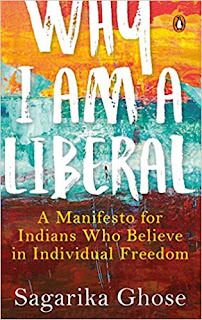 When Ghose defines the basic term ‘liberal’ she comprehends all the contextual references in history, even she understands the limitations of the term then why she is using this term as main theme of the book? Because she thinks that word ‘liberal’ is central to all social, economic and political debates at this moment. She believes that ‘the Hindutva nationalist government born in 2014 has shattered the fragile yet prevailing liberal consensus that had existed since 1947.’ So in the present political and social scenario the importance of progressive and liberal thinking is more significant as compare to the period of the twentieth century because people are being divided in the name of religions, casts and creeds. ‘Creating political divides is the essence of extremist ideology’, which is very hazardous for the healthy democratic essence. She claims that M.K. Gandhi was not just the father of nation he was also the father of Indian liberalism because he did not believe in enforcing his personal ideology through government agencies; and Jawaharlal Nehru was a ‘social liberal’ and B.R. Amedkar was a ‘quintessential liberal’ respectively. So her liberalism is multi-dimensional. Sagarika Ghose has been working as a journalist from the last three decades, so she understands how the governments and corporate bosses control the media in India that is why she realises that ‘institutionally, India’s press is dreadfully and shockingly weak’ because ‘muscular nationalism’ has set new norms in the contemporary journalism. She considers that anti-national is the blanket term to delegitimize and marginalise all those who raise questions in the ‘Modi-era zeitgeist. Even intellectuals are divided in two major categories ‘nationalists’ and ‘urban Naxals’. All though India is known to believe in diversity because Indian political and social system is much liberal. But new-India has changed this definition now if anyone wants to live in India he or she has to prove his/her nationalism by sporting all the ‘bans’ imposed otherwise he or she would be categorized as ‘anti-national’. That is why Sagarika Ghose is claiming that individual freedom is important because the people of the world’s largest democratic country cannot be bound to certain believes of the any ruling party. She strongly criticises scaremonger in the name of nationalism because she trusts in civilisation which is ‘the idea of India’. She takes number of examples from history, politics and mythology to prove the cultural diversification in India. ‘Indian patriotism is not about making enemies of other human beings, it’s about making enemies of injustice, oppression and prejudice.’ she notes. It is shocking that the most of the prominent scholars, writers and reporters had been attacked, even killed and some got threating letters/emails every day they feel insecure their life because the far right groups are so active in the Big governments. When the orthodox Hindus imposes prohibition of meat or any non-vegetarian food with the help of mob or the Big State at that time they degrade and damage the true spirit of a religion which endorse the sectionalism and sectarianism. Ghose says that the religious extremism in any form is an extension of politicization and leads to degeneration and deterioration of a religion. She finds that the Hindutva has some injudicious elements which have nothing to do with the true Hindu traditions, the political Hindu are politicizing Hinduism merely. This thesis is proved with applicable quotes form The Bhagavad Gita where she authentically differentiates the true Hindu and a political Hindu; at the end of this discourse she concludes that ‘Hinduism sits easily with liberalism because of its rejection of authoritarian power.’ So she is very clear about the true spirit of a religion and its importance in our life; she quotes some significant incidents form the holy books to prove something in the context of liberalism and cultural diversities in India. India has the second largest Muslim population in the world but what an ironic that they feel ‘not safe’ in their own country because some political ‘agents’ and their accomplices are constantly asking their loyalty and commitment to the ‘nation’ which is hazardous for Indian democracy. She says that the decision of demonetization was an act of ‘rampaging’ Big State power, because at the movement the government had a not only ‘temporal power’ only but she had a certain ‘sacred power’ that is way the decision of demonetization was apotheosised as a purification rituals. She believes that coalition governments have tended more liberal, consensual and respectful than governments with massive mandates because the massive mandates may lead to centralise the policies, endorse the ‘ban culture’, stamp out individual freedom and break all the institutional checks on the power of the Big State. She acclaims the work of Narendra Dabholker, Govind Pansare and Gauri Lankesh who made conscious efforts to resist Hindutva majoritarianism or ‘saffron terror’. Ghose has a faith in liberal ideology; she has a firm determination that ‘the pen is the foremost enemy of the sword because the sword does not have a solid case against the pent.’ But what a satirical that every government tries to control the power of the pen, even in ‘secular congress’ she finds some culpabilities, ‘It was secular congress who in Indira Gandhi’s time imprisoned 253 journalists and Rajiv Gandhi, who tried to bring in Anti-Defamation Bill.’ So her retrospective analysis of historical events is much balanced. ‘The true journalist is a patriot when she tells the truth, a blind ‘nationalist’ when she falsifies it for political ends’, she writes. She genuinely believes that it is the duty of a journalist to reveal the truth. Ghose finds historic recurrences in the two major political parties in the BJP and the Congress like: ‘A Congress government once created a terror-spreading Jarnil Singh Bindranwale in Punjab in the 1980s; today’s BJP-led government rarely condemns terror-spreading cattle protectors or gau rakshaks.’ So she demands a genuine accountability form the Big State that a state should act against perpetrators of such type of terror and violence. Ghose rejects reservation for women in politics because liberal must discard the quota mentality and the group identity mentality because that type of reservation undermines individuality for the sake of narrowly defined collective. We always live in a current and contemporary history because in our times a history writes itself. This book reshapes some liberal thoughts a manifesto for Indians who believe in individual freedom in the context of contemporary history. Though, this book does not give us a certain answer of the contemporary political, economic, and social issues rather than it is a question bank which defines the accountability of the Big State as well as the accountability of the individual one. This book consciously makes an effort to save the ideology of liberalism in India and spirit of federal multiculturalism. If one understands the true spirit of liberalism in India he or she must read this ‘polemical book’.